Digital technologies offer dramatically more effective methods of collecting safety and efficacy data from clinical trial participants and patient populations without the need to bring them into a study site. Our virtual study solutions enable the collection of scientifically meaningful cognitive endpoints and patient outcomes from recruitment to clinical research and post-marketing; reducing study timelines and costs with validated research apps for use on wearables, smartphones and online. Our cloud platforms allow for real-time collection of data from around the world, providing better access to data and accelerating decision making in clinical trials. CANTAB cognitive assessments are recognised by regulatory bodies as clinical endpoints used to definitively demonstrate the cognitive safety or efficacy of a compound. Cloud technology enables CANTAB testing to be consistently conducted globally to maximise data quality and accelerate data availability. 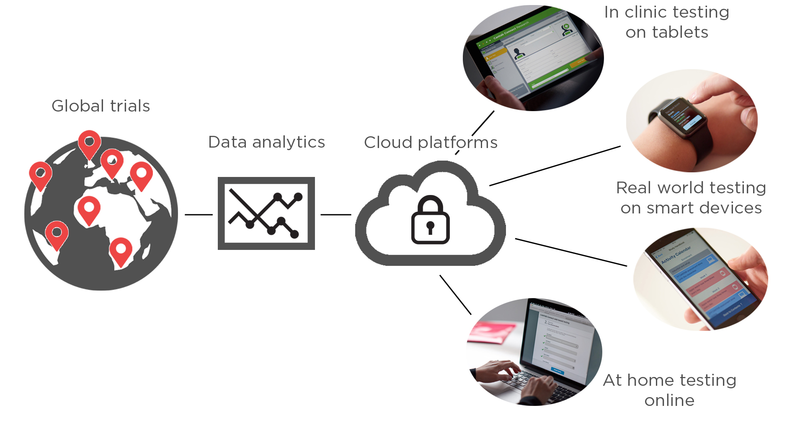 Our web-based testing products allow researchers to accurately assess participants online outside of laboratory or clinical settings and capture data remotely from around the world on secure cloud platforms. With clear on-screen instructions and voiceover guidance, participants from a wider geographical area can be virtually assessed, with automated assistance replacing face to face administration, quickly and more cost-effectively than ever before whilst observational compliance checks ensure data remains valid and of high quality. We develop study-specific wearable and smartphone software for high frequency, real-world data collection. Our Cognition Kit technology enables the collection and analysis of cognitive function, physiological data and patient-reported outcomes on a patient’s own device. Our wearable and smartphone solutions enable more frequent and effective patient monitoring and engagement, measuring brain health in everyday life and improving the understanding of the real world impact of clinical interventions. Our patient-centred design approach to virtual studies puts individuals, rather than investigative sites, at the centre of the research process. Remote patient-centred recruitment, enrolment and retention programmes, data collection, and long-term follow-up evaluation all offer opportunities to increase research efficiency and productivity.